Windows Risk Preventions is what’s known as a fake anti-virus infection, that is designed by cyber criminals to con you out of your hard earned money, and sometimes people don’t even have a clue that they are being conned. These viruses are so dangerous because they actually look like legitimate anti-virus programs, which is why so many people have been taken for by these cyber criminals behind the infections. Some things you will notice if your computer is infected with one of these viruses is that everything will appear to run extremely slow and sluggish as well various windows not being able to open properly and complete the simplest of tasks. These are all attributes of a computer infected with a fake anti-virus. 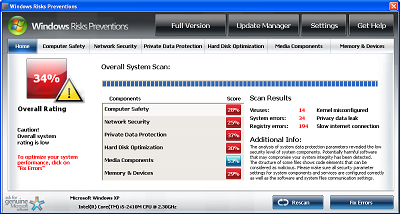 How Do You Catch The Windows Risk Preventions Virus? You normally catch these sorts of viruses by opening spam emails or clicking on suspicious links to a untrusted website. A new tactic these cyber criminals are using is to attach the virus too a number of Google images so when you click on the Google image then virus will immediately start to download onto your system without you even knowing.